​"June 12th, the army commenced the movement in the direction of the James river. The next day the advance reached the vicinity of Wilcox's Landing (O), where signal communication was immediately opened with Fort Powhattan (M) and Wilson's wharf. Through these lines the general in command was placed in communication with the army under Gen. Butler, and was enabled to call for the means requisite to transport the Army of the Potomac to the south bank of the James. During the passage from Wilson's wharf to Windmill Point (P) signal lines were opened across the river, thus enabling corps commanders to issue their instructions conveniently and speedily. In this manner the crossing of the troops was expedited and materially aided. In the prosecution of this service, Lieut. T. R. Clarke reported for temporary duty to the commandant on the gunboat Mackinaw (Q), then stationed in the river to cover the passage of the army and the removal of the pontoon bridge. The army was now enclosing Petersburg. June 16th the advance of the command approached the city, and the day following stations of observation were established at Gen. Hancock's headquarters, the headquarters of Gen. Smith, and those of Gen. Warren upon the left of our army. From these stations, the position of the enemy could be distinctly seen, and the arrival of additional troops could be noted. As the lines of our army were extended to the westward, stations were added in such numbers and were given such position as to command a view of all that was transpiring along the front." LC 33265. "Wilcox Landing, James River, Va."
LC 20238. 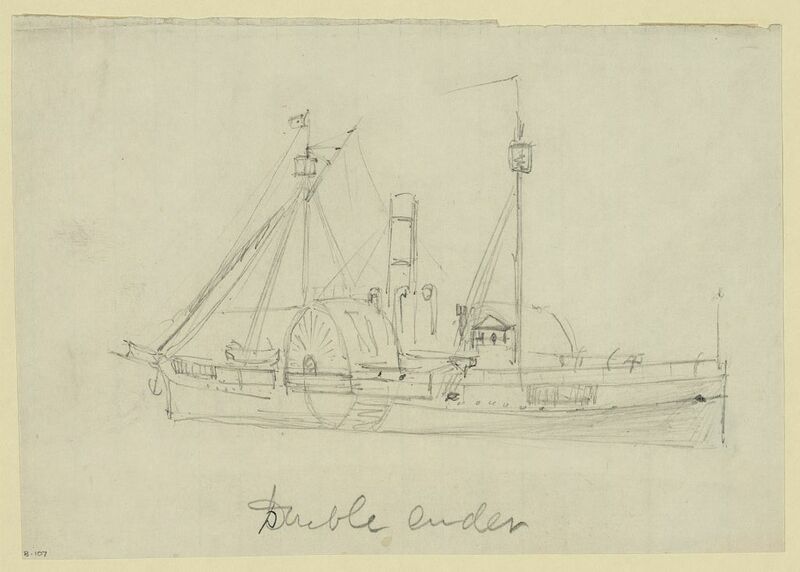 "Double Ender," drawing by A. R. Waud. The gunboat Mackinaw was a double-ender of the Sassacus class. Map from The Signal Corps U.S.A. in the War of the Rebellion, page 426, showing relative locations of signal stations established by the Signal Corps at various times during the Richmond and Petersburg Campaign. Letters and numbers are keyed in discussions in the book. 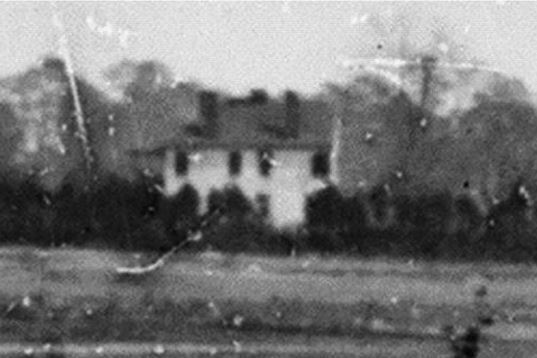 ​"After a week had elapsed the following important stations were in operation: Station A, at the Walthall house, upon the extreme right of our lines, commanding a view of the city of Petersburg, and a section of the Weldon railroad, near the depot, a broken view of the country extending from Cemetery Hill southwestward to the lead works, and thence around several miles, westward of the city to the line of the Appomattox: also a view of the left bank of the Appomattox, from the hills back of Pocahontas to Fort Clifton, with all the batteries or works between these two points. In addition, the officer upon this station intercepted the daily reports of the observations made by the enemy's signal officers from the Chesterfield Heights." LC cw0607000. Detail of schematic map by Andrew McCallum depicting Federal regimental locations on April 2, 1865. Note the signal station near Fort Friend. ​Station C was located upon a hickory tree near Prince George Court House road at an elevation of eighty-five feet. This afforded a view of the lines from the Appomattox to the vicinity of the plank-road, of Cemetery Hill, the city, the country for several miles west of the city, and a small section of the Richmond pike about one mile from Pocahontas." "Station D was established upon the Avery house, giving a close view of the works east of Cemetery Hill, and thence southward; also a section of a road northwest of the city, running toward Richmond. 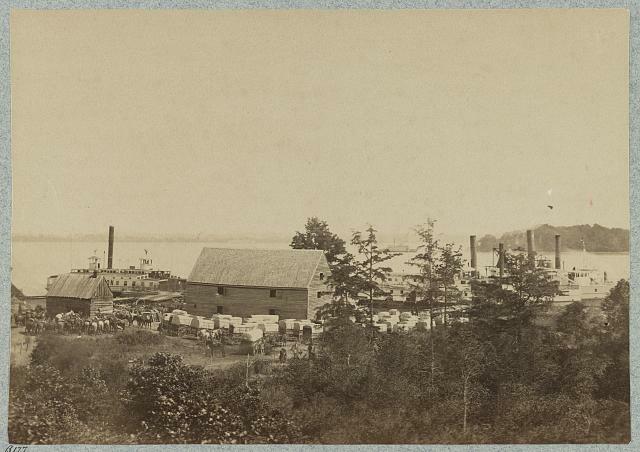 ​Station E, near the Jerusalem plank-road, commanding a good view of the enemy's works from the east side of Cemetery Hill to west of the Weldon railroad; also of the roads leading out of the city in the vicinity of the lead works -- such as the Weldon railroad, the Boydton plank-­road, and the Squirrel-level road. ​It can hardly be supposed that the extreme breadth of country here under observation and carefully scrutinized did not afford a field for onerous and conspicuous labor. The call for activity was incessant and the reports were almost numberless. The labors of the Corps were so arduous and exhausting that there was little inclination to retain copies of the messages when not compelled to do so by military order. As a consequence the complete records of individual observers are not numerous." "June 23rd, our lines, having been extended west of the Jerusalem plank-road, were drawn out toward the Weldon railroad. The enemy detached a portion of their army to operate against this flank. This movement, made by a column numbering 10,000 infantry and several batteries of artillery, was discovered from the Plank-road station, and reported to the general in command, thus giving timely infomation which enabled the general to take the necessary precautions to thwart any design the enemy might have had in view. When the expedition under Gen. Wilson was expected to return, the enemy concentrated a force of infantry and cavalry in the vicinity of Reams's station on the Weldon railroad, south of Petersburg, to intercept the column. The movement of these forces from the vicinity of Petersburg was discovered by the signal party and reported. A few days later, July 1st, the main portion of the troops that had been operating against Gen. Wilson were reported returning toward Petersburg." "I have to-day read a number of messages from enemy's station on Custom House in city of Petersburg. The code used is similar to the one captured from the enemy more than a year ago. I have only been able to read part of the messages, and from the tenor of them I judge that the party is the same that has been lately operating on the James river, and that they are endeavoring to open communication from Port Walthall and vicinity to Petersburg, and their left. Also that Geo. Pickett's headquarters are near Port Walthall, and that the enemy has lookouts in trees near that place. The station was driven from the Custom House in the afternoon by our shells, as the last message intercepted was, ‘Look out for our flag on your side of the river.'" "Meanwhile the siege was prosecuted with vigor by our forces. With the development of our lines additional signal stations were established; every eligible position which afforded an increased view of the enemy's works was occupied. The more important stations, however, were those already mentioned. The duty required was exclusively that of observation, the field telegraph rendering aerial signals unnecessary. Besides, the stations were so conspicuously located, and in such close proximity to the rebel works, that any motion which revealed their presence was hazardous. After the return of the column sent by the enemy to Reams's station, the apprehensive feeling then prevalent was dispelled. The presence of this large force on our flank and rear had occasioned considerable alarm, and when the signal report came that the cause of anxiety was removed, there was renewed confidence in the vigilance maintained by the signal observers. There were now daily movements of the enemy's troops. A new line of intrenchments was under construction, and the old lines were strengthened. This work and the movement of regiments was carefully watched from the signal stations, and all information of importance conveyed to the general in command."